What do Sprays, Paint, Baby Wipes and the last Wednesday in May all have in common? My last post as guest designer for May. Hello again, Ruby Craft here. First thing I want to share is how much I have enjoyed this month on the eP blog. I enjoy challenges, they bring out my crafty, creative side. Kim has given me the opportunity to work with some new products that I have not used before has made this a fun challenge. When I started thinking about my final project, I knew I wanted to make a scrapbook page and try a few things I hadn't tried before. I've seen quite a few designers using baby wipes to apply product and decided it was time to give it a try. 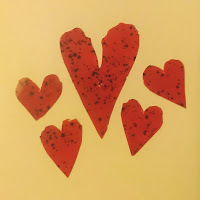 I usually don't use sprays and paints on scrapbook pages either, so I wanted to try them too. When I first saw the Alphabet Stamp from Catherine Scanlon Designs, I thought of my grandson, Jasper, and how much we enjoy reading together. So naturally I wanted to use the stamp again too because that is what my scrapbook page is about. Reading with my grandson, Jasper. First I started with the Prima Finnabair Elemental Stencil and Color Bloom Spray. Always shake the spray well. 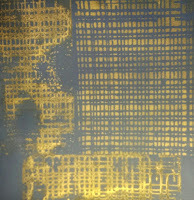 The stencil I used is Weaving. 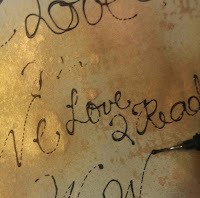 I placed it randomly around the page and sprayed the Vintage Metal Gold Foil Color Bloom Spray through the stencil. 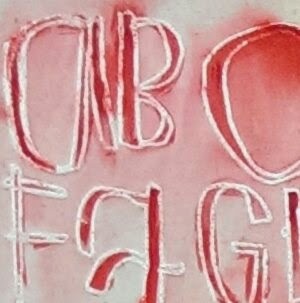 This left some spray on the surface of the stencil. 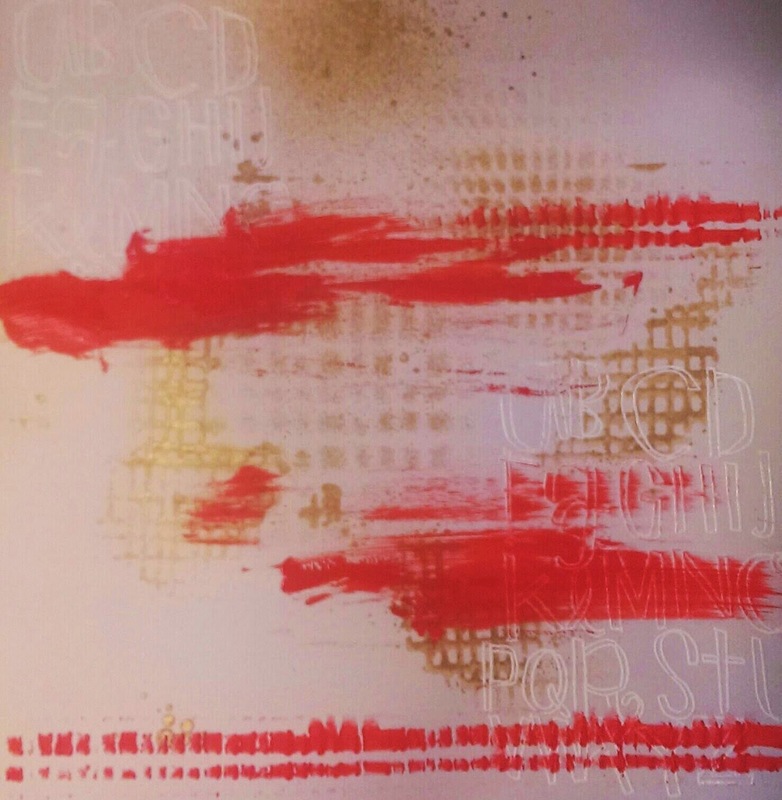 So I flipped the stencil over and pressed it down on the page. 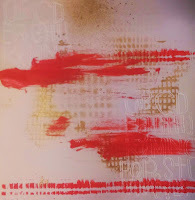 Then I removed the stencil and randomly spritzed the page. In a few more spots I pointed the sprayer down and just lightly squeezed the trigger repeatedly to get splatters instead of a spray. (You have to be very patent with the splatter part, if you squeeze too hard it sprays instead of splatters.) 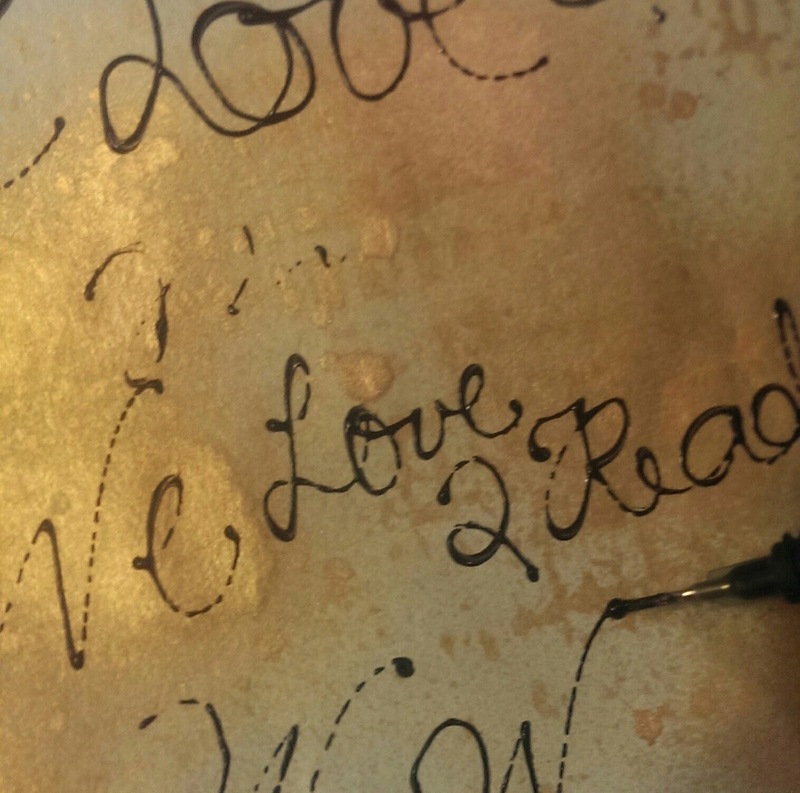 After the some of the splatters I tilted the page so I would have a few gold drips too. 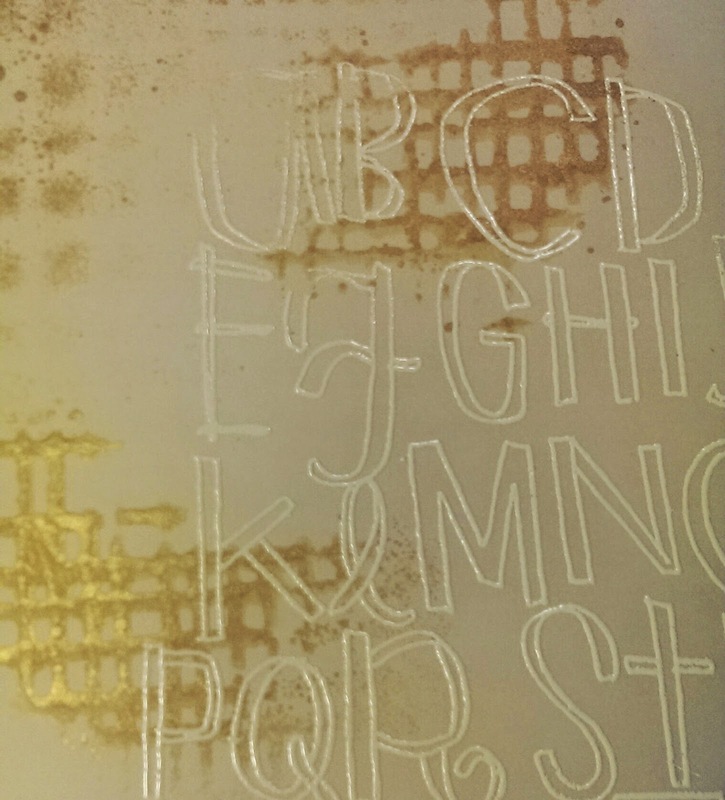 The next step was to use embossing ink to stamp part of the Catherine Scanlon alphabet stamp in the upper left corner of a cream color piece of 12"x12" cardstock. 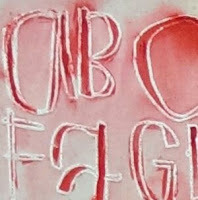 I used white embossing powder to heat emboss the letters. 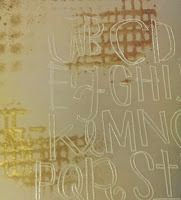 Then I stamped the letters in the lower right hand corner and heat embossed them too. By barely dipping a baby wipe in the Dylusions paint I was able to get plenty of paint to make swipes of red across the page. 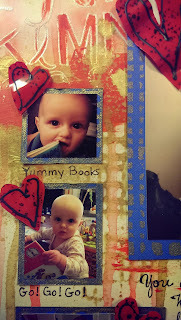 I also place the stencil back on the page and used the baby wipe to make a patterned stripe across the bottom of the page then added two more patterned stripes on the right top of the page. It is amazing how much paint you can get from the baby wipe after just a tiny dip in this full bodied paint. Working in small areas at a time I used a small pointed paint brush and painted the inside of the letters with Postbox Red Dylussions Paint. I lightly misted the paint with just enough water to make it start to move on the page. After a few seconds I tilted the page and let the paint drip down the page. Working 3 or 4 letters at a time gave me a little more control. I matted my photos and wanted to get an idea of where I would place them. Since I was using Red paint I decided that I would go with primary colors, using gold as my yellow that left blue for my mat. 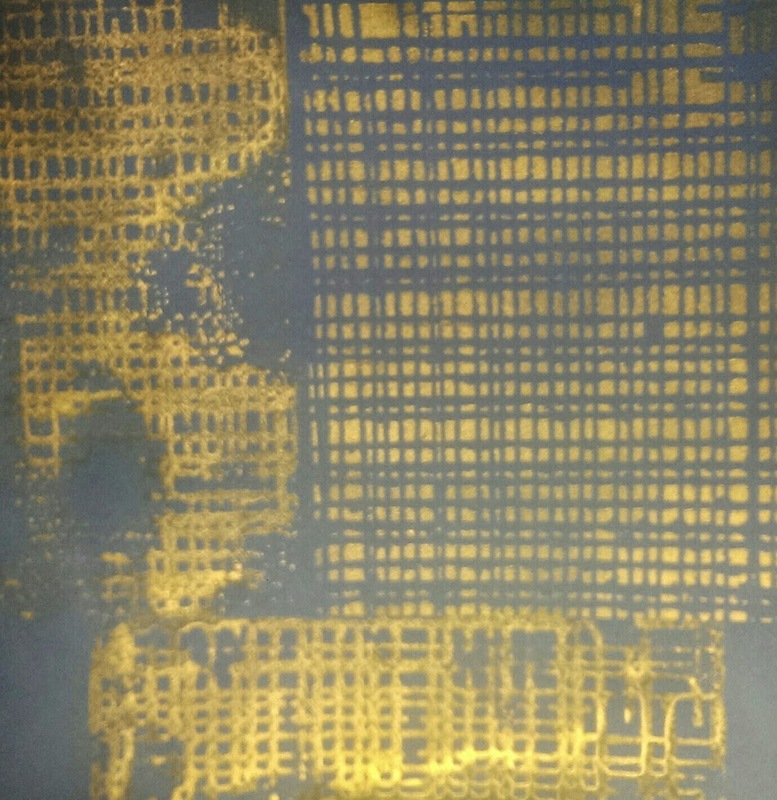 I used the gold foil spray again with the same spraying and flipping then printing effect with my stencil on a piece of 12"x12" blue cardstock. My main photo is 5"x7". The smaller photos were cut apart from a collage print. I moved the photos around on the altered cardstock, lining them up with the grid where I thought the pattern worked best, then trimmed out 1/2" from each side of the 5"x7" photo and 1/16" border for each of the smaller photos. Once the photos were matted, I moved the photos around on my page until I found a layout that worked with the background I created, keeping in mind I would need a space for my title and an area for journaling. I didn't attach them to the page yet but knew where they were going. Now I had an idea of where my Title would go and how much room I had for my journaling. Hand lettering is a popular trend right now and Dina Wakely's fine tip applicators made it easy to add a handlettered title to my page. This was the first time I had one of her tips. It screwed right onto her paint tube and allowed me to write with her paints. The first thing I did was practice. I was amazed at how easy it was to get the look I was going for. Large loopy letters. When I drew faster it skipped like stitching. If I drew slower the lines were smooth. By slowing down more and the lines went from thin to thicker. After just a few practice tries I was feeling like a pro, so I went for it and wrote my title on my page. I loved it! After a little drying time I was ready to adhere my photos to my page, add my journaling and put captions under my photos. But I wasn't finished yet. Where did those adorable little hearts come from? 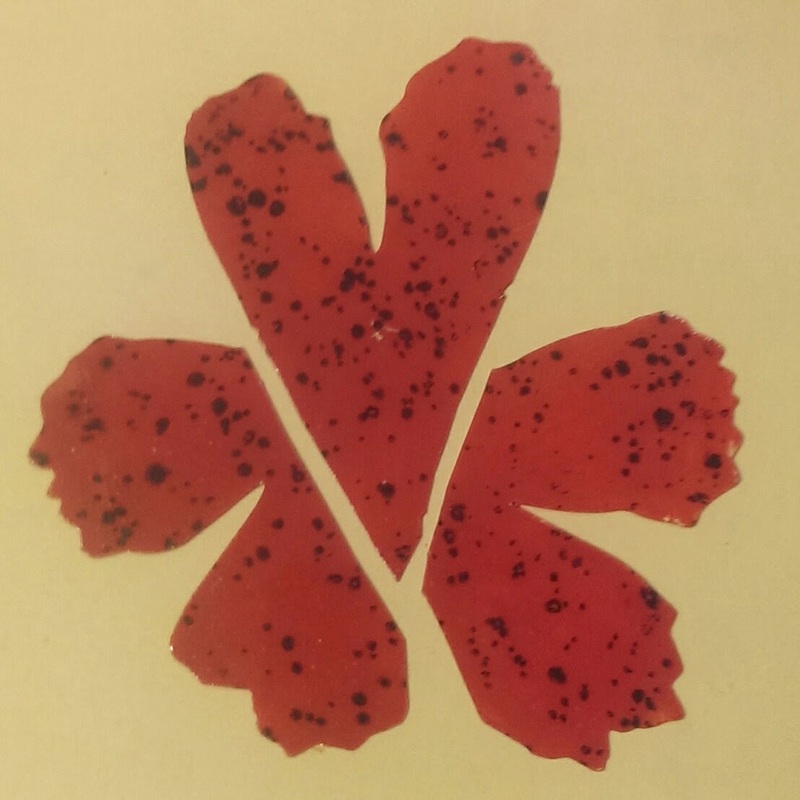 If you saw my first guest post you might remember a little red flower I made for my journal cover. I had so much fun working with Wendy Vecchi's Clearly For Art Modeling Film, I had made quite a few extra flowers. So I took a large flower and cut it up into hearts. They were already painted with the Postbox Red Dylusions Paint but I used Dina Wakely's fine tip applicators and paint to add the black outlines for a fun touch. Then I heated the hearts up with my heat tool and shaped them into little waves and sprinkled them around my layout, attaching them with pop dots. Of course I was having so much fun with Dina's fine tip applicator I had to add a fine line dotted and dashed border around the sides and bottom of my page as a final touch. When working on my projects each week, I tried to use mostly what Kim sent me along with things from my stash that she carries in her store. This was for two reasons. First, I know that when you show someone a new product and they like it they want to be able to find it. Second, Kim was very generous and sent me products to use for my guest designer posts. She also encouraged me to create anything I wanted and is she is super easy to work with. So of course, if you don't already shop there, I want to encourage you to check out the eclectic Paperie store. If you like you can use the links above to make it easy to find the products I used. Thanks Kim for giving me a shot and if you ever want me to be a guest designer again just let me know. It's been fun. 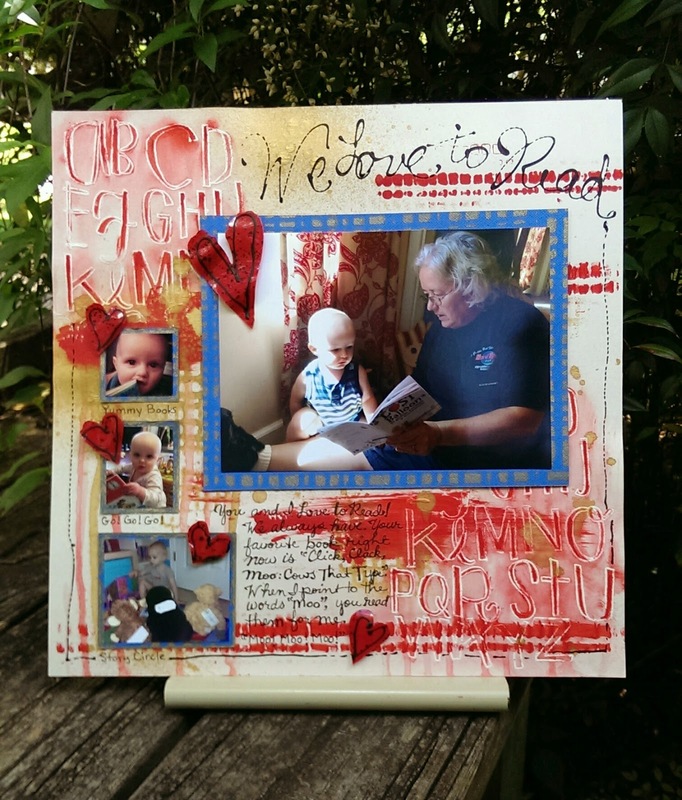 Wonderful project, Ruby! Thank you so much for sharing your talents with us this month!! Hugs! Thanks Kim! I enjoyed being guest designer for May. It was fun to receive my package of goodies and look at new ways to create. Hope your followers saw some things they liked. Looking forward to seeing who your June guest designer will be and their art.